Hotel Novotel Erlangen. Book your hotel now! Free Wifi! In the timeless, comfortable rooms at the Novotel Erlangen midscale hotel, stay close to the city center in an ideal location. The shops are within walking distance. Two children can stay in Family Rooms free of charge. The hotel is also ideal for business travelers, thanks to the desk space and free WIFI in the rooms, as well as the light-filled conference rooms. Enjoy the modern food concept offered by our bar lounge and eatery "Novo²" or relax in our sunny garden. 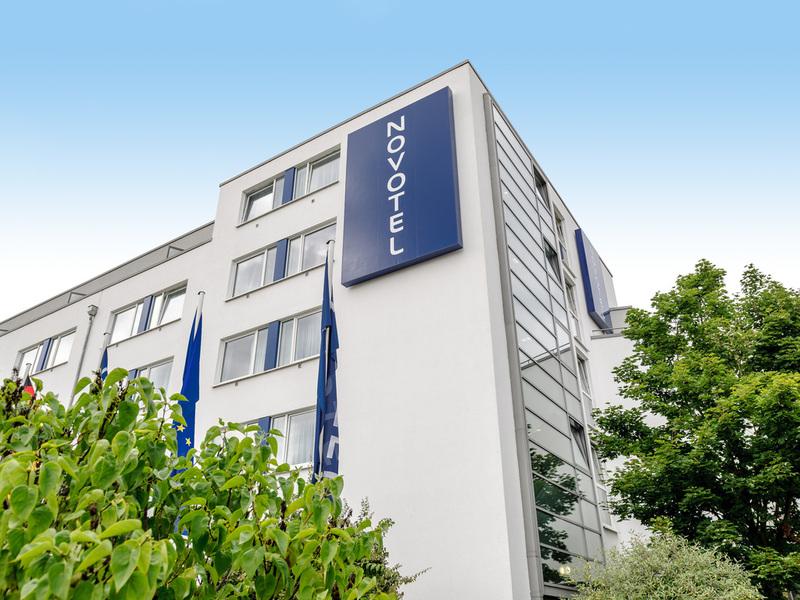 The Novotel Erlangen is situated a 3-minute drive from the A73 highway, close to the old town and the university hospital. It sits amid numerous company locations. The pedestrian zone with many shopping opportunities, the castle gardens and the Bergkirchweih fair are within walking distance. From here you can easily explore the Playmobil Funpark, Nuremberg Castle, the Toy Museum or Nuremberg Zoo. Even the airport and the exhibition grounds can be reached in 20 minutes. The air-conditioned lobby bar that seats up to 25 people is the perfect place to relax and enjoy good conversation with other hotel guests. Why not take this opportunity to while away the hours in a sociable atmosphere. Pro: Very friendly staff, clean room, good breakfast choices. Con: Unfortunately no fridge in room. Very pricy compared to the tiny room size. Insufficient wardrobe space for clothes for a 6 nights stay. A lot of street noise with open window, and A/C not working (no cooling, just fan) - so window had to be open. The Novotel is modern, functional and comfortable. All staff are always polite and professional I do think even the basic rooms should have a fridge for cold drinks. Even budget hotels offer this. My stay wasn't registered with my Membership No 30…7809, which means I didn't get my points, which also meant I lost the points I already had, because I haven't stayed for a year. comfortable - the gentleman who check me in could remember which side of the room I like to stay..
Again, a very pleasant stay! Everything was good and breakfast was wonderful. Front desk staff was friendly. The location for my needs was very good, the room was big enough, bed was also very comfortable. The smell in the bathroom actually was bad. Expensive stay for the quality delivered. Great staff. Nice breakfast. Too expensive for the quality of the room etc. I honestly could not believe the fact that you charged &quot;Restaurant No Show&quot; at 15:30 EUR. I was delayed in flight due to cancellation from KLM, and therefore arrived the next day. I called, even though late (at 21:00) on scheduled arrival day to let you know. I accept a &quot;No Show&quot; for the room, but charging me for not eating breakfast the following morning is outragious. Had that not been the case, my overall experiance rating would have been a 10. Shame on you! The facilities are clean and the staff was friendly and professional. reception and breakfast were good. But it is ridiculous that high-speed WiFi is super expensive with 6euro/day. Always try to stay here whenever I travel to Erlangen for business. Staff Is always friendly, food is very good, and support or needs are always met.